A nugget weighing 6.664kg (over 214 troy ounces) was recovered on Friday, June 13, in Siberia. 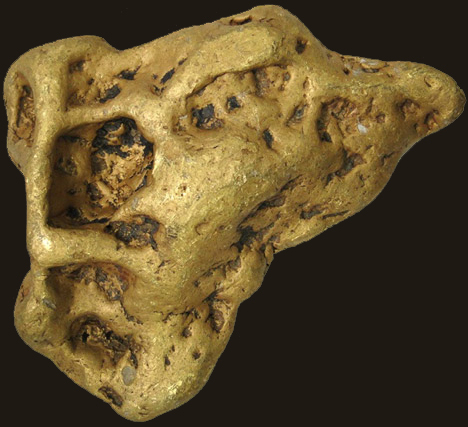 The nugget was cast aside with larger rocks during the screening process but it was found later by an employee at the Ukhagan mine in the Bodaybinsky district according to The Daily Mail. Local administrators said the nugget is being referred to as the "Devil's Ear" because of its shape, and a statement released by the group listed other "devilish" circumstances. "The nugget was found on Friday, June 13, ahead of a full moon," said the report. "The weight also favors secrecy -- there are three sixes -- and the shape is very similar to a pointy ear. So miners called the find 'Devil's Ear' right away." A worker was apparently leveling a pile of rocks when he found the huge nugget. Sergey Kozlov, Uhakhan director, said, "The nugget was found in a new mine that according to preliminary estimates doesn't have that much gold. But the miners are very hopeful that an old saying 'one nugget never walks alone' will work for them again."